1 large eggplant such as Market Supreme. Rub the rounds with salt and let them sit on your sink 5-10 minutes to leach out the bitter tannins. 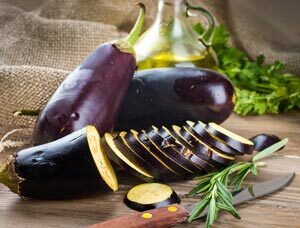 Rinse off the eggplant slices in cold water to remove excess salt and pat dry on kitchen towel. Now heat a couple of tablespoons of oil in a large frypan. Heat to moderately hot. Add the eggplant slices and cook each side until browned and starting to go soft. While they are cooking, break the eggs into a cup and whisk with a fork. The combination of crispy egg bits and soft eggplant is really lovely.